Uncle Bob’s Butter Country™ manufacturers delicious buttermilk syrups to enjoy on pancakes, waffles, french toast, and crepes alone, or try it as a delicious sweetener for fruits, hot cereals, ice cream, and more. Our fresh dairy blend is a break from the all-too-ordinary imitation maple syrup. We understand that breakfast is often rushed and interrupted. 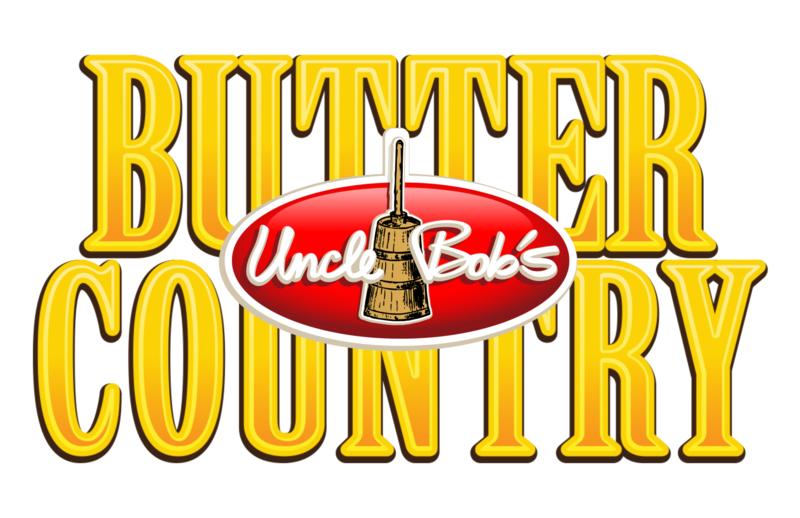 Uncle Bob’s Butter Country™ is not only a return to traditional farm fresh flavors, but also to farm ideals when eating a hearty breakfast together as a family was a way of life. Our purpose is to gather the family together round the table and enjoy one another while also eating delicious food. While our story began thirty years ago as a friend scribbled a buttermilk syrup recipe on a post-it-note, our story truly took shape as our family enjoyed this syrup on top of whole wheat pancakes in between smiles and laughter. Every meal is different, but with Uncle Bob’s Butter Country Syrups™ you can always count on one thing– a hungry family gathered together at the table. Uncle Bob’s Butter Country Syrups™ are available at Harmons grocery stores, Peterson’s Fresh Market, The Store (in Holladay), The Market (at Park City), Reams (in Springville), and Day’s Market (in Provo). Uncle Bob’s Butter Country Syrup was so delicious that I used a spoon to sip the rest off of my plate! You know how they talk about a land flowing with milk and honey? Well, I think they might have meant buttermilk syrup. In our home, there is no sense in making pancakes or French toast if we are out of Uncle Bob’s Butter Country Syrup. Maple just doesn’t cut it anymore. In 1983 my wife and I attended a pancake social. “Have you tried this syrup?” she asked. “It’s REALLY good!” I tried it and immediately asked for the recipe. Homemade buttermilk syrup instantly became our family favorite. One morning I made pancakes for my family, but we ran out of buttermilk. Out came the imitation maple syrup. My children pushed their plates away. Their faces said it all. That syrup simply would not do. It hit me – this was no ordinary syrup. Years passed. As the syrup recipe improved, the clamor from family and friends for Uncle Bob’s buttermilk syrup grew louder. “Enough!” I said and immediately decided to take this syrup to market. My son and I spent hundreds of hours creating a lasting buttermilk syrup without jeopardizing the farm fresh taste. Finally, Uncle Bob’s Butter Country Syrups™ are now available for you to enjoy with your family as I have with mine. I hope you enjoy this syrup on pancakes, hot cereal, fruit, ice cream, and more. It’s creamy deliciousness! This entry was posted in Food and tagged butter, Food, pancakes, syrup on August 17, 2017 .